It’s that time of year again…Bridal Show SZN! 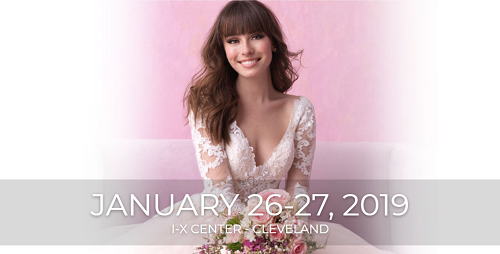 Everyone here at Cleveland Music Group are so excited to be a part of these great bridal shows this year. We will be there to help you out with all of your wedding entertainment needs. We hope to see you there! This guest blog post is courtesy of Tricia Dever from Always Eventful Wedding & Event Planning. She has been kind enough to share her top wedding planning tips with our readers. 9. After budgeting, book your major vendors: Wedding Coordinator!, Location, church, Photographer, Videographer, Florist, Wedding Music! 8. After major vendors are booked, you can spend months thinking and planning the details! The cake, the dress, the linens! That is the fun stuff, so look around, gather ideas and take your time in making decisions. Thank you to Brandi Hamerstone, an amazing wedding planner and owner of All Events Planned, for sharing with us her thorough list of 2010 wedding trends! I know I might end up sounding biased on this one, but wedding planners seem to be a hit in 2010. Not just full planning packages, people of all budgets and all service levels are seeking out planners to fit their needs. I don’t know many weddings being planned without SOME level of assistance from a planner. I’m happy to report that fondant is going away and buttercream is back and better than ever. After too many appointments with brides trying to explain that fondant does not taste even half as good as it looks, they are all heading back to the ever-popular buttercream, phew! Matching color, but not matching style bridesmaid dresses. Brides are now just giving a few specifications to their bridal party (blues, nothing above the knee or backless) and letting them make the choice of the dress. This always seems to end in a huge success. Your bridal party tends to be friends that think JUST like you so you end up with different, fun styles of dresses that still fit with your perfect wedding day style. Dessert Buffets. Finally, the bride and groom “get it” and their traditional parents have accepted that the cake isn’t usually a big hit at the wedding. Candy bars have gone away (phew) and now dessert bars with wonderful, colorful and elegant varieties of miniature desserts are making their entrance. Yummy! Favors are no longer favorite. So many couples are using the money that would be spent on favors to donate to their favorite cause or to a different cause based on the passion of each of their guest. While choosing a foundation that best represents every individual takes lots of time, the bride and groom feel good about doing something special for their guest while helping out those in need. Memories are made in pictures. Finally, finally the bride and groom are understanding the importance of good pictures. Good pictures, not staged, not poorly lit, not portraits, just GOOD pictures. The skill level of some photographers is well beyond that of even the greatest hobbyist that the money you spend will always be worth it. Uncle Jim might love taking pictures, but he can’t convey the elegance, emotion, love and celebration through photos like a good wedding photographer can. Guest book changes are coming in 2010. I am not seeing the generic white book with the “classic” white pen in stand at the sign in table. Now there are memory stones, photo journals, photo booth books and even the engagement book as the signing book. They are all great changes and fun ideas from the bland and basic book of past generations. Trying to decide whether or not to hire a wedding planner? You might want to read this article by Denise Shaw, owner of “Brides Best Friend” Wedding Planning. She’ll help you understand why having a wedding planner can be so priceless. As a wedding planner, my suggestions for all our wonderful brides is to remember that this is YOUR day. Get SOMEONE to help you, whether you are very organized or not so organized! !